You need a table to group the figures. Start with the fighting gamblers, than add the other figures around the table. Pay attention to the gestures. In the end, add the female figure in the foreground. In a tavern a card player has drawn a knife and is about to attack his victim, firmly grabbing his short hair. The victim, a fellow player from the other side of the table, cries out and seeks to ward off the blow with an open hand. The light falls harshly onto this brawl from the left, accentuating the drama of the tense situation. 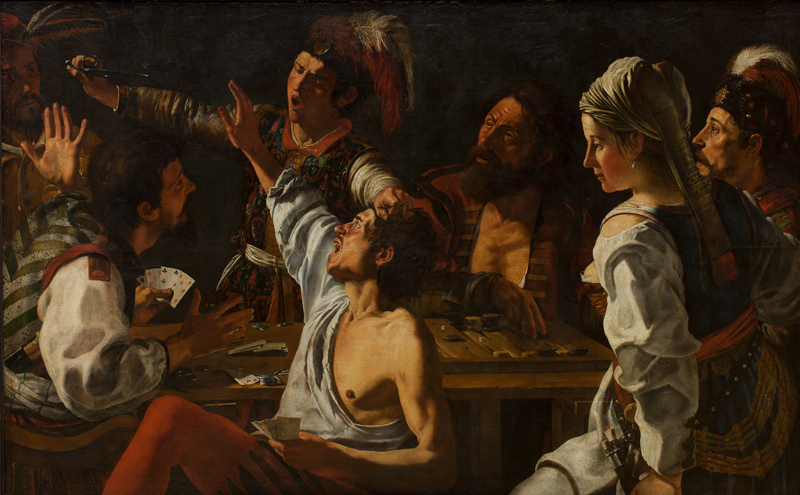 The card players, the half-figure composition, the realism, and the stark contrast between light and darkness are all elements borrowed from the Italian Baroque artist Caravaggio, whom Rombouts got to know during a prolonged stay in Italy. By making uncontrolled anger the main subject of the painting the Flemish painter draws on an ancient Dutch tradition for creating moralising depictions of the seven deadly sins. Wrath was one of them.